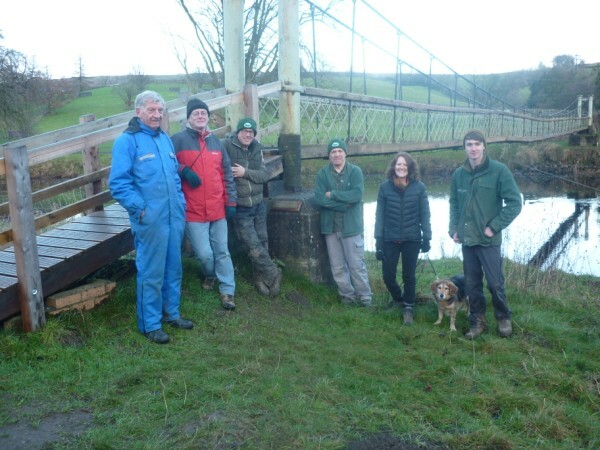 Members of the Dales Way Association committee, and their dog, meet up with the Ranger Team from the Yorkshire Dales National Park Authority to admire the bridge, refurbished by the team. The work was made possible by a generous donation by a Dales Way member. 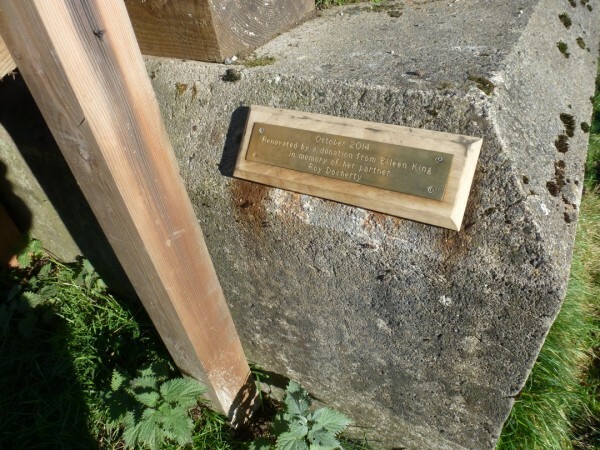 The plaque is in memory of her recent partner. This entry was posted in Uncategorized on December 20, 2014 by Alex McManus (Footpaths). How many people walk the Dales Way? In 2006 the Yorkshire Dales National Park Authority, in an exercise to plan future policy and budgets re tourism, decided to introduce a people counter at a squeeze point along the Dales Way footpath. This would determine how many people actually stood on it. It would then have to make a projection as to how many it thought were doing the whole journey. Between December 2011 and April 2012 there was a “glitch” as can be seen on the charts. Sheep celebrating Christmas and an extended New Year perhaps could be the culprits. The footfall site is between Cam High Road and Dent Viaduct, so it is reasonable to think that day walkers would be few. The DWA think 85% of these numbers are doing the Dales Way. 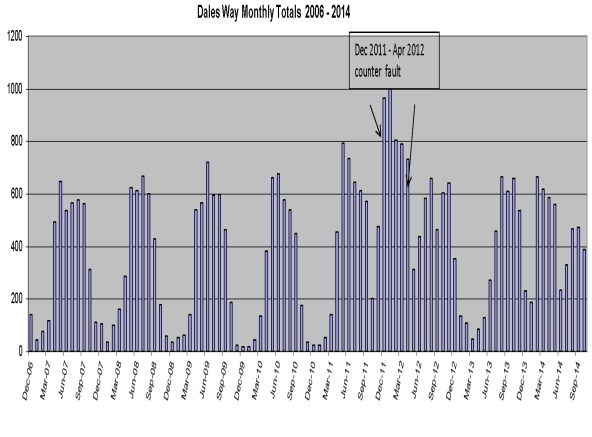 The charts show the regular fluctuations in numbers in each week and month of the year, with walkers still stamping on the device, whatever it is, even in December. The total number of [footfall] walkers on the Dales Way footpath always comes as a surprise, but also reassures us, that our work to do whatever is required to sustain the footpath is worthwhile. We appreciate the YDNPA’s initiative in supplying us with this information. This entry was posted in Uncategorized on December 3, 2014 by Alex McManus (Footpaths).